Bharat Sanchar Nigam Limited (BSNL), the state-owned telecom player today launched free Wi-Fi facility at Udwada Village, Valsad District, Gujrat under Sansad Adarsh Gram. BSNL announced this facility in the presence of telecom minister Manoj Sinha. BSNL has installed two Wi-Fi hotspots with 17 access points at Udwada town in Gujarat state, which is known for Zoroastrian Atash Behram. Under the Sansad Adarsh Gram Yojana Wi-Fi service, the population of 6000 citizens in the village, as well as surrounding area, will be benefited says BSNL. It is also stated that Rs 16.48 Lakh is allotted to BSNL for carrying out the program in Udwada Village. And with this launch, citizens of Udwada and surrounding area will be able to use unlimited Internet Data and Udwada Village has become Digital Village. BSNL also stated that it’s completely working in-line Prime Minister Narendra Modi’s vision of Digital India. 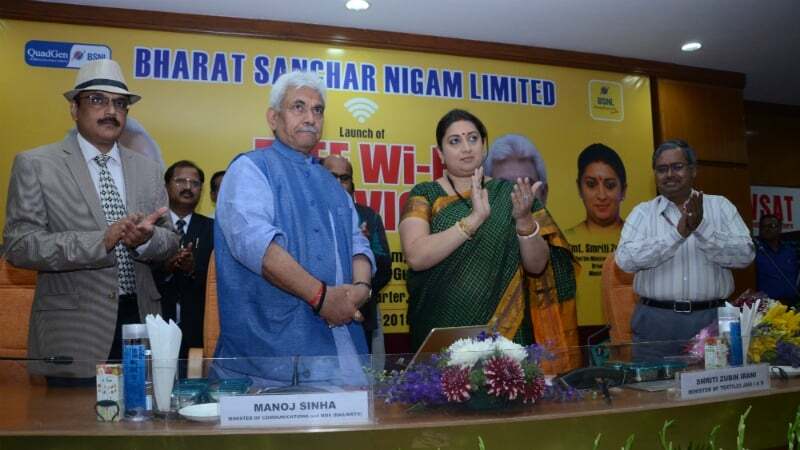 As stated, telecom minister Manoj Sinha was present at the launch event and appreciated BSNL’s efforts for extending Wi-Fi facility to Udwada village. Sinha also confirmed that BSNL would deploy 35,000 Wi-Fi hotspots on PAN India basis to improve the broadband penetration with 2G/3G mobile data Wi-Fi offload solution. Under this project till date more than 7700 Wi-Fi hotspots have been installed, stated Sinha. BSNL is undertaking the project for providing 25,000 Public Wi-Fi Hotspots at Telephone Exchanges of BSNL in rural areas using BSNL fiber as per the MoU signed between BSNL and USOF. Till date, BSNL has provided Wi-Fi at more than 2500 rural telephone exchanges. BSNL has already provided more than 7700 Wi-Fi Hotspots on revenue share basis through various partners namely QuadGen, Trimax & GOIP. Furthermore, BSNL was recently awarded Rs 25,000 crore worth projects from the government. BSNL will be laying the optical fiber-based network dedicated for use by Defence worth Rs 13,334 crore and Rs 6,500 crore for the execution of the second phase of BharatNet Project. Jinko ghar me broadband diya he unhe to accha speed nahi de paate aur chale he free ka WiFi dene.worst experience with BSNL never suggest any one for BSNL broadband.